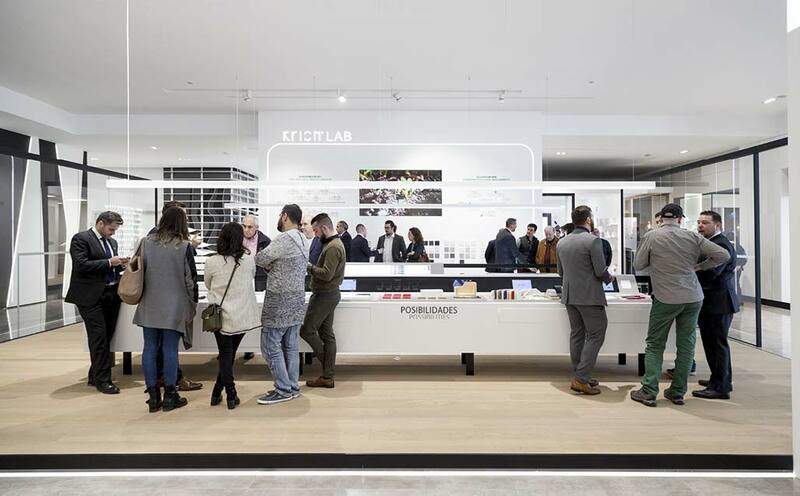 On Friday the 2nd of February, PORCELANOSA Group brought the twenty-fifth edition of its International Global Architecture and Interior Design Exhibition to a close, which coincided with the 45th anniversary of the company’s establishment. For another year, the figure of over 14,000 visits was achieved, significantly increasing the impact on the hotel sector, as overnight stays increased by more than 25% compared with previous editions. This increase in visitors was seen equally in the eight firms which make up the PORCELANOSA Group, and in the case of KRION, could be observed by the number of guests visiting our display at all times. The Fusión entre 2 Artes (Combination of 2 Arts) event, held on Tuesday and Thursday, must be noted, in which Manuel Alonso, a chef with a Michelin star and two Repsol Suns, and Alicante sculptor Quico Torres, conveyed the original idea of the Teulada Moraira Auditorium in our installations for their gastronomic event Dolia, which also appeared at Gastrónoma 2016, a combination between gastronomy and sculpture, with the sea and KRION as common factors. With regard to the material, K-LIFE continues to amaze all who visit our exhibition, and the new Opale Series has been very well received. For another year, the combination of KRION with other materials such as wood, metal, ceramic, etc., has fulfilled expectations, combined in the Workshop space. If you were not able to visit our installations, you will be able to do so shortly in our 360º Virtual Visit; and if you did visit, thank you for accompanying us on the important date of the 25th anniversary of our exhibition. THANK YOU FOR YOUR ATTENDANCE AND SEE YOU NEXT YEAR!! !